The warm weather of late spring brings many interesting insects to S. California gardens. Among the most fascinating are the dragonflies. From May through fall, dragonflies may be seen in any garden providing insects for them to eat. One of the more common – at least in western Los Angeles County - is the Flame Skimmer, Libellula saturata. The scientific name for this species is pronounced lie-BELL-you-luh sat-you-RAY-tuh. Dragonflies and the closely-related damselflies are carnivorous insects in the order Odonata. The odonates are an ancient group of insects: fossil dragonflies are documented from well before the time of the dinosaurs (early ancestors from the Carboniferous Period). At that time, some odonates were huge, with wingspans several feet wide. Today’s dragonflies are smaller, but still have some of the prehistoric characteristics that make them ‘living fossils’. Dragonflies have several notable characteristics. First they have relatively large heads, equipped with large, compound eyes. In fact, dragonfly vision is among the best in the world. Dragonflies also have two sets of elongated wings, which allow them to maneuver in flight in astounding ways. Like many insects, dragonflies go through several developmental stages before reaching adulthood. True to their ancient lineage, the juvenile forms (nymphs) are aquatic or semi-aquatic. Eggs are laid in water, on vegetation near water or in other moist places. That’s why dragonflies are commonly seen around ponds, pools, marshes and slow-moving streams. If you have dragonflies in your garden, there likely is a water source nearby. Flame skimmers are among the larger local dragonflies. 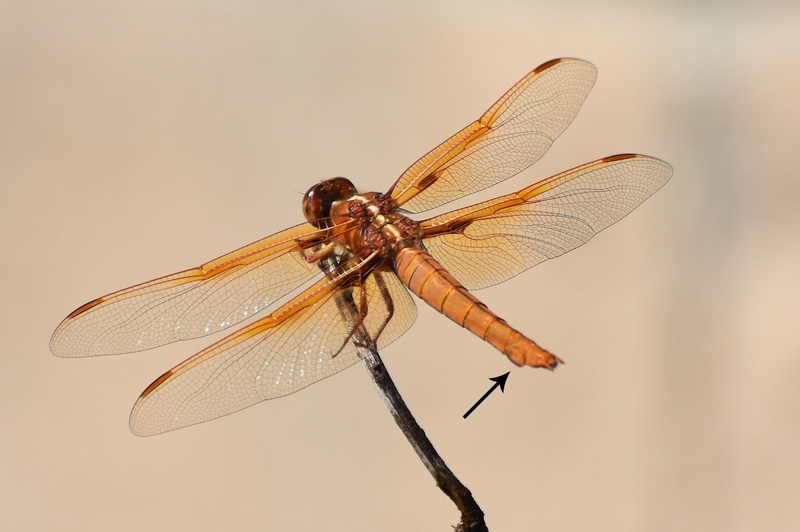 They belong to the family Libellulidae – the Skimmers – the largest dragonfly family, with over 1000 species. This family includes dragonflies that hunt for prey while flying, as well as those who perch and wait for prey. The Flame skimmer is one of the latter, making it relatively easy to photograph. Flame Skimmers are native to western U.S. from ID and WY to California, TX and northern Mexico. Adults range in size from 2-3 inches (5-7.5 cm) long. The males are entirely bright orange, including their body, eye, legs and wings. We don’t have good photographs of a male, but recommend the excellent images from references 1 and 2, below. The only local species that are remotely similar are the Neon Skimmer (more brilliant red in color) and the Cardinal Meadowhawk (usually only seen in the mountains in our area). Females (above) are a lighter, browner orange (or even brown) with yellow markings. Their wings have less of an orange tint than do the males (male wings are orange to ½ their width). The females also have a conspicuous swelling on the 7th section of their abdomen (see arrow on photo above). Adults will eat almost any soft-bodied flying insect including mosquitoes, flies, butterflies, moths, mayflies, and flying ants or termites. In short, they are good natural pest control agents – although they also eat butterflies and other pollinators. Flame Skimmers hunt by perching on a rock or upright branch to wait for prey. They’re always on the alert for big, scary creatures (like you), as well as their next meal. They then dart out to catch the hapless insect. Watching them hunt is fascinating! Flame Skimmers lay their eggs in warm water. That’s why they are often seen near shallow ponds, lakes, slow-moving streams, warm marshes and even hot springs. Males are often seen cruising such site, which they defend from other males. The adults mate during the primary flight season (May-September). After mating, females lay their eggs by dipping their abdomens into the water, releasing the eggs. The immature nymphs (naiads) live in mud on the bottom of warm ponds, streams, and springs. Like the adults, they wait for their prey to pass by, affording them protection from other predators. The nymphs become quite large (over 1 inch (28 mm) long) and look like a stocky, hairy insect, with a rounded abdomen. We don’t have any naiad photos, but recommend those in references 3 and 4, below. If you run into them when cleaning your pond, just release them back into the mud. Naiads feed on a wide variety of aquatic insects, such as mosquito larvae, other aquatic fly larvae, mayfly larvae, and freshwater shrimp. They will also eat small fish and tadpoles. When mature, the adults emerge at night. Watch for these colorful dragonflies in your summer garden. Try to get some good pictures, and upload them to the iNaturalist site (https://www.inaturalist.org/). If you have a pond, you might even be lucky enough to see a nymph! The parade of native ‘bulbs’ continues to unfold in S. California gardens. 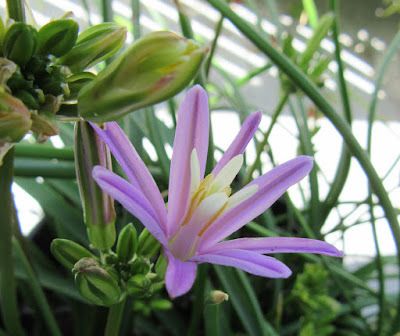 From the early-blooming Red-skinned onion and Blue dicks, to the late-blooming Tritelias and Brodiaeas, there’s usually something of interest from January through May. Right now the star geophyte is the California brodiaea, Brodiaea californica [pronounced bro-DEE-uh cal-ih-FOR-ni-cuh]. 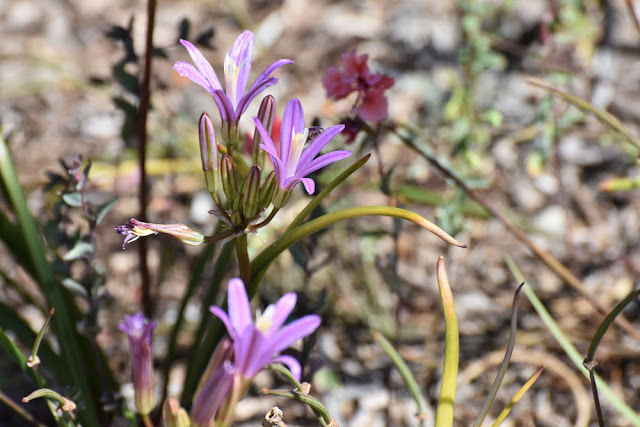 As its name suggests, California brodiaea is endemic to California, gracing the foothills and meadows of the North Coastal Ranges and northern Sierra Nevadas. It grows in gravelly, clay soils or serpentine, in the grassland, open woodland and chaparral communities, up to about 3000 ft. (900 m.) elevation. But it grows surprisingly well in a range of garden soils and climates, making it a staple perennial in local gardens. It is variously placed in the Lilliacieae or the Themidaceae, along with the California native Bloomeria, Dichelostema, Muilla and Triteleia. 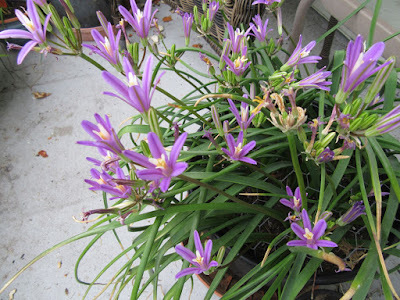 Brodiaea californica is a corm-producing perennial. 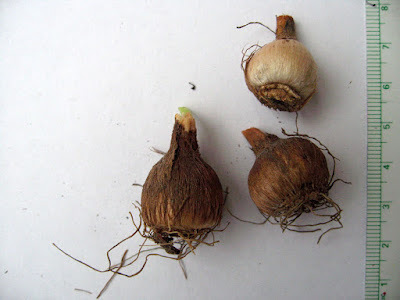 It dies back to its underground storage organ (the corm) after producing seeds. The corm is rounded and has coarse, brown fibers (see above). 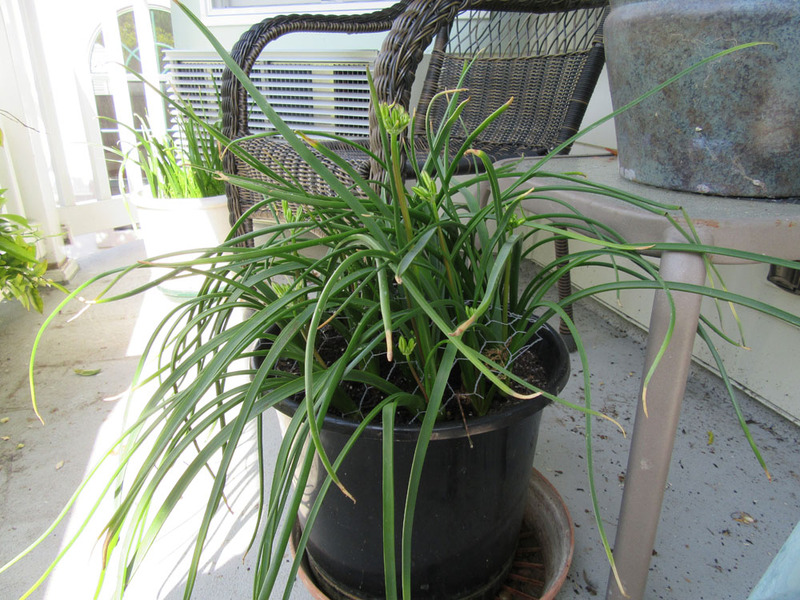 The plants remain dormant until the winter rains, when the stems begin to grow again. The plants first produce several leaves; then, with the warmer weather, they quickly send up flowering stalks and begin to flower. In our S. California gardens, the first green appears around February and flowering commences in late April or early May. Flowering can last up to three to four weeks. The leaves of Brodiaea californica are long and narrow – up to ½ inch wide and 24 inches long. Like most in this genus, the leaves are fleshy and medium green. In a dry spring, the leaves will begin to yellow and dry at their tips as flowering begins. Flowers are grouped in starburst-like umbels atop stout stems. Each umbel contains 8-12 upright flowers, each flower about 1-1 ½ inches (2.4-3.8 cm) in length (see above). The flowers may be white or pale pink, but those in Mother Nature’s Backyard are a lovely pale lavender. The flowers themselves have a specialized form. The perianth (fused petals and sepals; three of each) forms a long tube with a flared opening (see above). The pollen-producing stamens are surrounded by an upright, white, tube-like structure formed by the staminodia (sterile stamens). Such specialized floral architecture often reflects adaptation to specific types of pollinators. We recently observed a hummingbird carefully visiting every flower. 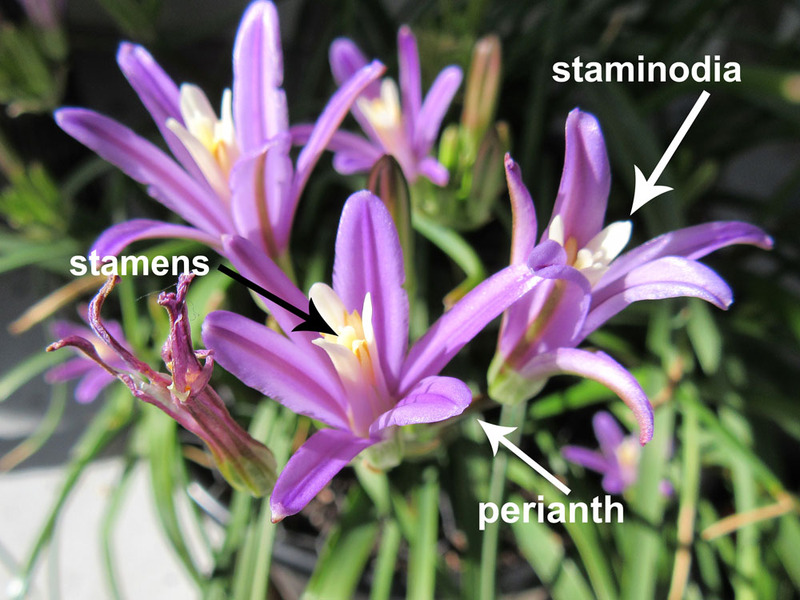 We were surprised to learn that little is known about the pollination of Brodiaea californica. We will continue to observe and photograph any potential pollinators, with the goal of adding to our knowledge of this species. We’ll also be more observant regarding the production of viable seeds. Here’s hoping! California brodiaea is an easy plant to grow. Once planted in the ground or in a pot, it needs only adequate winter/spring moisture and relatively dry conditions through the summer/fall to succeed and multiply. 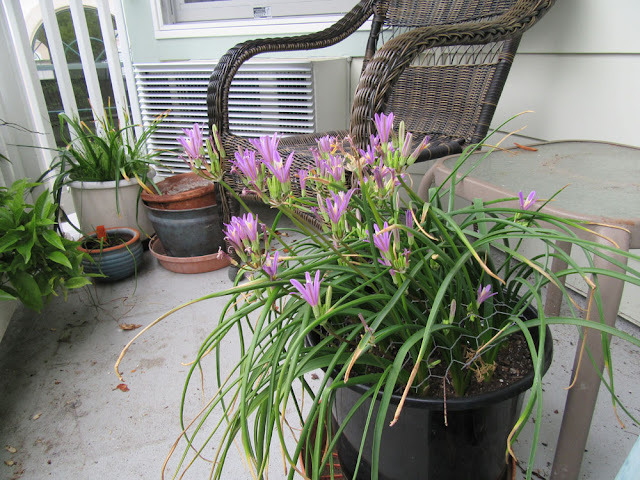 In fact, as it hails from N. California, these corms can even take occasional summer water – just don’t over-do. California brodiaea does fine in full sun to part-shade; morning sun is probably optimal in our drier S. California gardens. If you’re growing it in a container, provide a layer of fresh potting mix or ½ strength fertilizer in winter/early spring. This is truly one of the prettiest California native ‘bulbs’. The robust foliage and flowers compete well with other native wildflowers. We love the look of it with California poppy, the Clarkias and Gilias. Masses of Brodiaea californica provide pastel color when many spring-flowering annuals are already done for the season (in S. California). We welcome anything that provides color in the ‘between seasons’ period of May and early June. Its size makes Brodiaea californica a good candidate for the foreground in mixed beds. It also makes a good filler around perennial grasses, shrubs and herbaceous perennials. This is one of our all-time favorites for containers; it’s truly a conversation piece. 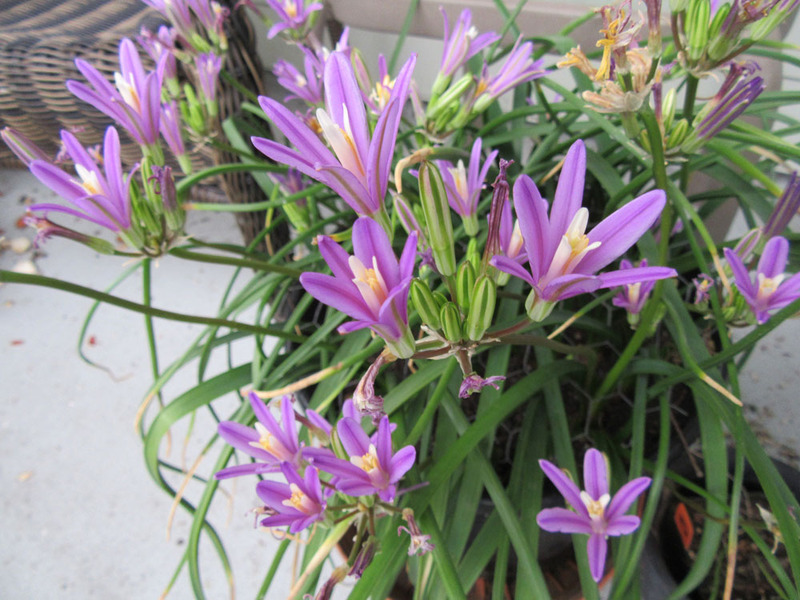 Place a container of California brodiaea near an outdoor seating area for maximum enjoyment. The corms were apparently eaten by native Californians, though we have yet to try them. We’ll try to learn more about their preparation. In summary, California brodiaea is one of our favorite native ‘bulbs’. It’s pretty, adaptable, robust and easy to grow. We hope you’ll consider adding a pot or two to your own garden. Just remember to order bulbs in summer – they sell out fast!